A lot of new plastic or vinyl interior items that you purchase for your Corvette do not come color-coded to the interior. Most times, these items come in black or gray, and will have to be dyed to match your interior. Sometimes, you may want to change the color of an existing item. There is no secret to doing this - all you need are the right products. These are readily available from Zip Products or your local PPG dealer. In this article, we will show you simple procedures used for dyeing vinyl or plastic items that will give professional results. So, let's get started! Here are some of the items that we will be dyeing, along with the products that we'll use. The dye and Sem Sand Free no. 38363 came from Zip Products. The PPG products came from our local PPG dealer. You may also need some masking tape and a well-ventilated area to spray the new items. The first step in dyeing any vinyl product is to clean it thoroughly with PPG no. 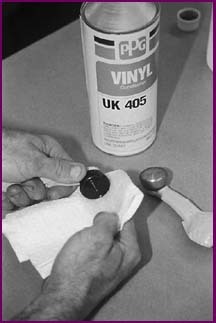 UK403 Vinyl Cleaner to remove any dirt, grease, or grime. Use a nylon bristle brush or coarse sponge to clean the item, even if it is new. Do this two or three times. After it is clean, thoroughly rinse it with clean water, and dry it completely. Wipe the item down with PPG no. UK405 Vinyl Conditioner. Use overlapping strokes and go in one direction only. Do not crisscross or change directions. After it is done, do not touch it with your bare hands. The oils in your skin can stick to the vinyl surface and keep the dye from adhering properly. You can now start to spray-dye the item. Work in a well-ventilated area and use light overlapping strokes. Do not put on heavy coats because this can cause runs or blushing. (Blushing means the dye will have a whitish cast and look dull. This is caused by too much paint, and humidity in the air. It is a good idea not to do any type of dyeing on rainy or high humidity days.) Allow about 5 to 10 minutes between coats, depending on the temperature (higher temp equals less time). When it is thoroughly covered, check it for light spots. If it is covered completely, let it dry about one hour. After it is dry, it will be ready for installation. Plastic items are a little different. If they're new, start by wiping each item with PPG UK405 Vinyl Conditioner. Remember, overlapping strokes in one direction. Again, don't touch the item with your bare hands. Note: if you are changing colors on an existing item, or it is a used item, start by thoroughly cleaning it with PPG UK403 Cleaner first, just like you would if the item were vinyl. Then go on to the vinyl conditioner. Now, spray the plastic item with Sem Sand Free no. 38363, available from Zip Products. This will open the pores of the plastic and allow the dye to penetrate. Here is the most important step. Before the Sem Sand Free dries, start to spray your first color coat on the item. Make sure that you get a complete cover coat. It only has to be a light cover coat, but it must be over the entire surface of the item. (Do not allow the Sand Free to dry before you spray the color coat. If you do, the color coat will not penetrate the plastic, and the dye or paint will not adhere.) 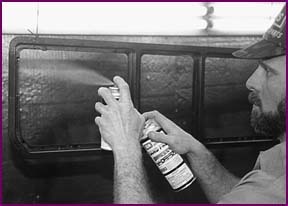 After the first coat has dried, spray light to medium overlapping coats until the part is covered to your satisfaction. 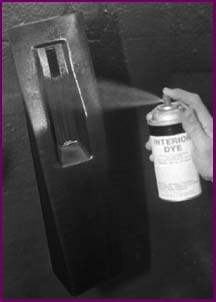 You do not have to spray any more Sem Sand Free after the first coat. Once is enough. In the picture, you can see we had both the Sem Sand Free and the dye ready to spray. 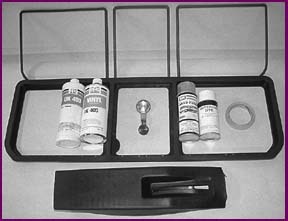 Dyeing vinyl or plastic is that simple! See a dealer near you. The author would like to thank Scott Coral of Greg Donahue Collector Car Restorations, Inc. for his assistance with this article. For a complete version of this story in print, look for Corvette Fever on your local newsstand.